Before we start, here's a fun video I made to put up on my FB page, showing them dancing around. Dancing Paper Garland from Pink Stripey Socks on Vimeo. 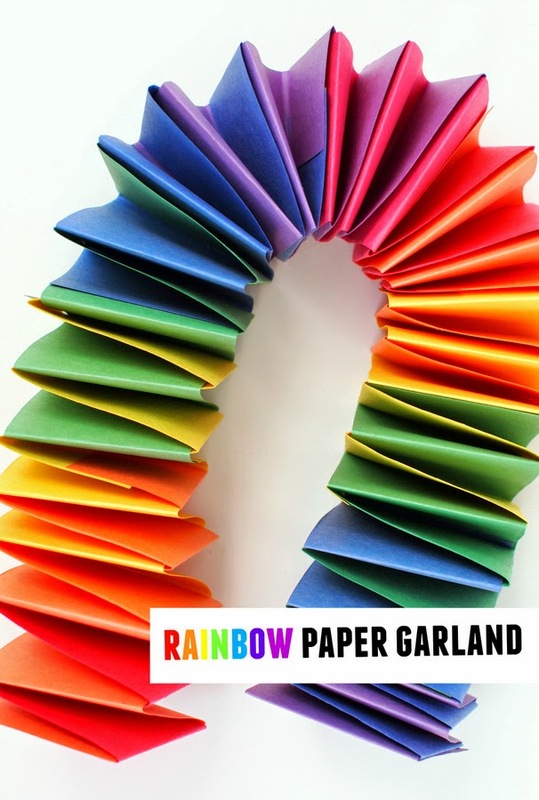 Ok. Ready to make a rainbow paper garland? Let's go! To make this garland, you just need colored paper, a glue stick, and scissors. That's it! Now it's time to start gluing your strips together. Using a glue stick, glue one end of a purple strip with one end of a blue strip. Then, fold the purple strip over. Then fold the blue strip over. Keep repeating this alternating pattern till your strips get too short. Now it's time to glue on the next colors. Glue on a green strip to your blue strip and glue on a blue strip to your purple strip. Repeat the folding pattern again until your green and blue strips get too short. Now glue on a yellow strip to your green strip and glue on a green strip to your blue strip. 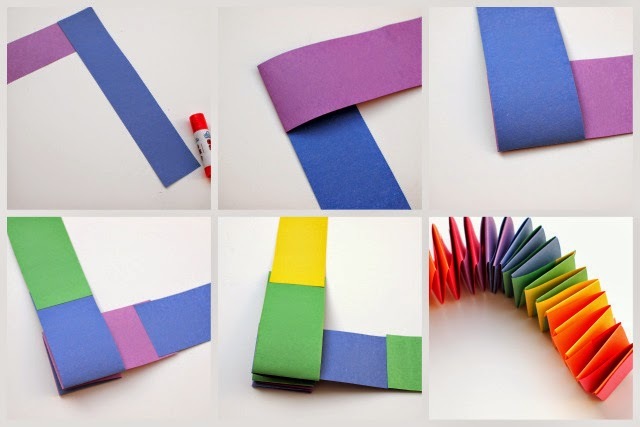 Keep repeating this folding and gluing pattern over and over again with different color strips. (Remember, you're going through the colors of the rainbow.) After awhile, you'll have a lovely slinky paper garland. Glue the ends to each other when you're done! The results of the folding and changing colors are really gorgeous! Doesn't this totally scream, "play with me! play with me!" 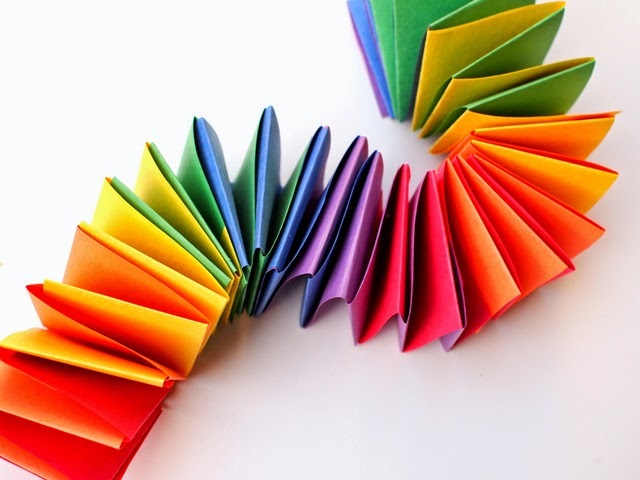 I really hope you have fun making this paper craft with your kids! 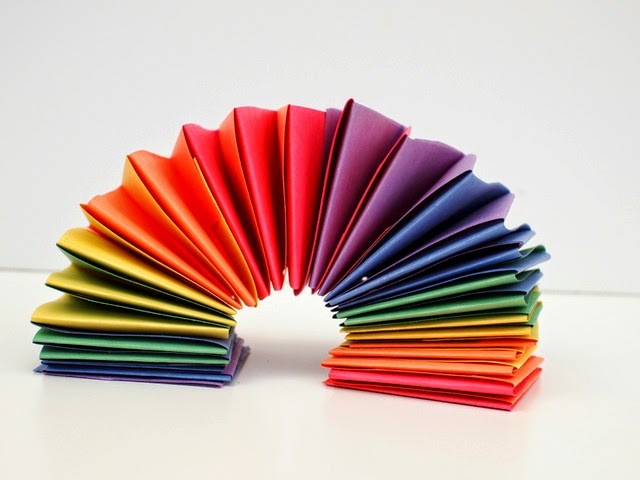 And if you're looking for other easy cut and fold paper crafts, check out the links below!